Shortly after we both were saved (in 1989, at 36 years old), Judy and I began attending a non-denotational church here in Raleigh. The pastor offered a powerful sermon one Sunday morning on the subject of our stewardship before the Lord. It was not so much about financial obligations in support of the ministries of the church as it was about the use of our time and talents. Sadly, I have a very poor memory, so I count the recollection of that sermon as a reflection of its importance. The illustration I remember most was from the Pastor’s own life. Back in the early 90’s Day-Timers (small paper notebook scheduling calendars) were in vogue and he was never without his. As I recall the Sermon was early in the year and he was explaining how, as he set goals and objectives for the coming year, one of the first things he did (over Christmas) was to write in the bottom corner of each page in his Day-Timer the number of days it has been since he was saved, a slash mark, and then the number of days he had left to live (based on actuarial tables). After making the illustration, the rest of his sermon revolved around the importance of those numbers, as day-by-day, the first number got bigger and the second, smaller. This past Sunday as I was thinking/praying about the upcoming Offertory Prayer. My thoughts landed on stewardship and that Day-Timer illustration from so many years ago. Even though God knows us from eternity past (Eph. 1:4-5), in a sense, God starts a countdown timer at the point we are conceived (Psalms 139:14). It displays the number of days we have in this “human” phase of our eternal existence (1 Cor. 15:54-55). Tick-tock, tick-tock, tick-tock…… the invisible (to us) countdown timer continues to mark the days, as we live out our lives through the good times and the bad times, though job changes, houses, kids, sports, church, etc. Like the game of musical chairs, the music will stop at some point, unknown to us when the last tick-tock is heard by God. As believers, that will be a glorious time with new, sinless, healthy bodies in a wonderful, eternal place called Heaven. However, embedded in that eternal joy, peace, and love is a lesson for those of us whose clock has not yet run out….. Many interpret this verse solely as a description of the brokenness of man on earth vs the joy awaiting us in Heaven. A few, based on Isaiah 65:17, treat this verse in Revelation as evidence that God will proactively wipe away just the memories of our sin nature, leaving good memories behind. However, I would offer the thought that, based on varying rewards and recognitions offered at the Bema Seat, we will have some knowledge of both the good and bad of our time spent on this earth (Rev. 22:12, 1 Cor. 3:11-15, 2 Cor. 5:9-10, 1 John 2:28, Rev. 3:11-12). Beginning with the statement “He will wipe away every tear from their eyes,” it suggests [to me] that God might actually need to comfort us as we enter Heaven…. I think when we get to Heaven and clearly see our sin nature and all the lost opportunities He gave us to serve Him rather than serving ourselves, we will be in tears. It will hit us, just as we are entering Heaven for eternity, no longer able to serve God from a position of faith (1 Cor. 13:12). The times we squandered watching TV, stressing over the minutest details of earthly life, in conflict with our neighbor, missing opportunities to share God’s love, etc., will confront us. As we face the outcome of our actions and inactions, we will be overwhelmed with sadness. Relative to eternity, our time as earthly foreigners (Phil. 3:20) is infinitesimally short in this sin-cursed world, but holds so many opportunities for kingdom ministry that we will never have on the other side of the grave,….. tick-tock. This year our church is reading a Bible plan together called F260. I am excited as I hear about the changes that are happening and the insights being gained by each of you. I pray that God will use this in our lives to draw us closer to Him individually and as a church. As we are learning of God’s goodness and His word we are to actively share what we are learning with others. We are calling this “Breathe” as we inhale His word and character and exhale His good news. I have been able to share with a couple of people outside of our church membership and am excited to see that they too are joining us in reading the Bible. Click here to read another report of another church in Canton, Ohio who is also doing the plan in 2018. What wonderful news to read about God’s saving work through just reading His word. As I hear from others I am struck by how few of us believers will take the time to read the Bible. I am afraid that the American church culture has started to read the Bible like one might just read the dictionary. We can treat it as the “go to” source to find points to prove a theological point or to address a cultural moment, or pressing emotion. Yet, the Bible has an overarching story that is life-giving and is a gift from God to us. As one person has recently written, we need to be Bible-readers and not just Bible-quoters. There is supernatural power in just recounting God’s story with others. As I shared with one young man last month, he observed, “I can tell you did not make up this story, for no one can make up a story such as this.” For those of you with children living with you, don’t be afraid to make this a part of your family time. Let your children be exposed to God’s word in your home. “You’ve been given a great gift, George: A chance to see what the world would be like without you.” This compelling quote is from the classic movie, It’s A Wonderful Life. Each year around Christmas, one of the networks will broadcast this timeless gem, and I am compelled to watch it each time as if I’ve never seen it before. Of all the aspects of the movie that I love, I think the irresistible force over me is simply the acting of Jimmy Stewart, who plays George Bailey. It is he who is given the gift, even as he considers taking his own life after he tells God, “I’m at the end of my rope.” But to convince him that his rope is much longer and better than he thinks, George is granted the opportunity to see how different the lives of his loved ones, and even the fate of his entire town, would have been had he not lived his “ordinary” life. The wife of a friend was recently diagnosed with breast cancer. Being in the vicinity of her late 40’s to early 50’s, she was understandably surprised to learn of her condition at such a young age. Healthy and active and a follower of Christ, she nevertheless fell victim to this dreadful disease. But in speaking with her dear confidant and mentor, she was told that she had been given a great gift. She had been granted by God the opportunity to live out her faith in the midst of dealing with terrible news. How she processed this unwelcomed setback, and the ways in which she chose to deal with the prognosis and treatment, would speak to many people as to the strength of her faith and the depth of her reliance on God. Having just experienced the joys of Christmas, we have been reminded that gifts come in all shapes and sizes. They are wrapped in the most unique ways, and they sometimes mean much more, or much less, than was ever expected or intended. But nobody boxed up a batch of cancer and put it under the tree. Nor did anyone look in their stocking and then have to spend hours wrestling with the condition that they no longer existed. But such as these can be used by God to bring the greatest gift He offers, and that is to experience Him in a deep and loving relationship. God doesn’t pass out cancer like we pass out the gifts on Christmas morning. But He does offer the gift of knowing Him deeper and displaying that for the world to see. The Bible says that every good and perfect gift comes down from God, and also that He makes all things work together for good to those who love Him and are called according to His purpose. So, you hold in your hands, or have within your body, or are experiencing in your relationships, something that will be labeled. Will it be part of a gift that moves you closer to the God who loves you, who can use every situation as a means to express that love? Or will it be called something much worse, and be for you a means to step away from your heavenly Father? Your heart certainly longs for the first. 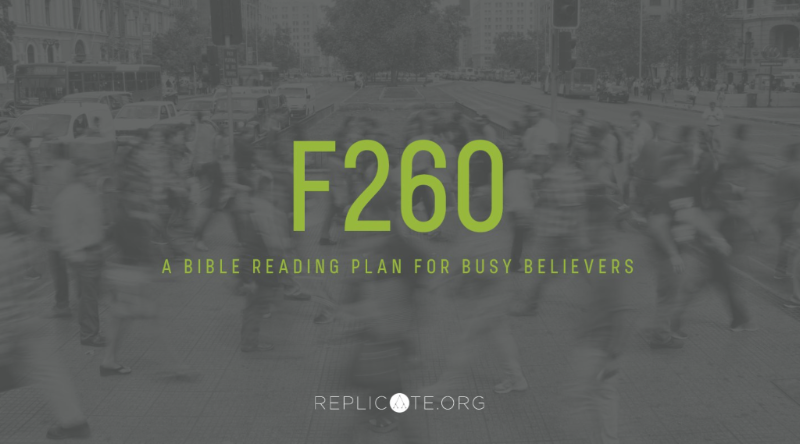 As a church we are beginning a church-wide Bible Reading plan called F-260. You can find more information about this plan here. In preparation of starting our Bible reading plan I read a very helpful article which you find here. Here comes our annual reminder to take stock and make fresh resolves. And for many of us, a new year means an opportunity to re-up on our spiritual disciplines. However poor our eating has been or however inadequately we’ve exercised, we never seem to end the old year with the fully functional “habits of grace” we want to enjoy in the new year. Inevitably, in this age, even the most basic spiritual-discipline inventory will give us something to feel guilty about. Could we ever avail ourselves enough of God’s ear in prayer? Ever memorize enough of his words in Scripture? Ever personally share the news about his Son with enough unbelievers? Without a seared conscience, we’ll annually find ourselves lacking in some way, and have more to aspire to on this side of heaven. So, if you’re looking for just one fresh spiritual focus for the new year, I’d like to offer a suggestion: Marry the Bible this year. Without downplaying prayer or fellowship or witness in the least, I say start with the Bible because hearing God’s voice in his word is the most fundamental of his ongoing “means of grace” for our Christian lives. Having his ear (in prayer) and belonging to his body (in the church) are equally essential, but they don’t play the same fundamental role, because the Christian life is not a symmetrical partnership between man and God. It may feel admirable to start a new year with a firm resolve to spend ten minutes in God’s word every morning. Ten minutes every day is a good step forward from less, or nothing. If that’s where you are, take step one first, then step two later. But don’t be naïve about where you stand after one step. And if dipping into God’s word for ten minutes is the grace and joy it really is (rather than mere duty), what’s keeping you from enjoying more? Receiving more grace? Basking in more blessing? As we look at the larger picture (“surrounded almost entirely by a Christless culture”), we see that a ten-minute glance is just a start. This is not a call to balance every single minute in the world with an equal and opposite minute in God’s word — God’s voice is stronger than Satan’s. But we will do well, here at the outset of a new year, to think how we can indeed walk with our God, and enjoy him throughout the day, and not simply touch base quickly for ten minutes. By all means, yes, make a habit of making a beeline to the Bible first thing in the morning in 2018. Find a realistic, enjoyable reading plan, let your reading give rise to meditation, and meditation to prayer. A daily “quiet time” or “time alone with God” is a great place to start. They are like date nights with your wife — but dates do not a marriage make! Consider what a “marriage” with God’s word might look like for you here as a new year begins. Perhaps it might include regularly hearing the Bible read. What tremendous opportunities we have in our day through technology to hear the Scriptures. Try the YouVersion app, or the forthcoming Dwell app. Hit play on the treadmill or in the car or while doing chores. The Bible was originally written to be read to crowds of listeners. “Devote yourself to the public reading of Scripture” (1 Timothy 4:13). In the history of God’s people and his church, far more people have heard his word read to them than have read it themselves. It’s a glorious gift that we have it ourselves today and can read it ourselves, but God also means for us to hear his word. Hearing engages us in a way that reading does not, and vice versa. Finally, marrying the Bible this year will eventually mean some fresh effort to share your nourishment with others. As the very life of God himself in and through his words dwells richly in you, and feeds your soul, you will want to extend and deepen your joy by sharing him with others. When we commend to others what we ourselves are tasting as sweet in God’s word, we enjoy it all the more. Hearts full of joy in Christ don’t stay full by putting a lid on them, but by taking the lid off and spreading out the feast before others. Marrying the Bible is not a sequestering pursuit. As God fills us with the spiritual life and joy he imparts to us through his word, he will put a word in our mouth and make our meal all the more filling as we pass it around to others. The dominos will begin falling as the word of God comes into its central, initiating, energizing place in our souls. David Mathis (@davidcmathis) is executive editor for desiringGod.org and pastor at Cities Churchin Minneapolis. He is a husband, father of four, and author of Habits of Grace: Enjoying Jesus through the Spiritual Disciplines.